On April 20-26, 2019 in the legendary half-century-old ecovillage of Findhorn, Scotland, the Climate Change & Consciousness: Our Legacy for the Earth will take place. 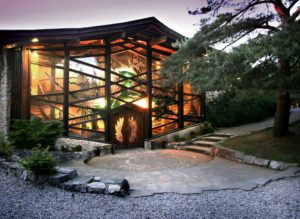 The Universal Hall at Findhorn, the main conference venue. It will be a collaborative and participatory investigation into how we can steward a sustainable future on what has already become a radically changed planet Earth. We have traveled to this “new” planet on a burst of carbon dioxide. A new planet requires new ways of living. The conference will bring together eminent scientists, wisdom keepers, business people, activists, artists, entrepreneurs, young people and others, to envision and begin to inhabit our joint future. It will be an international, inter-generational and multi-disciplinary gathering. This is the principle of “the big tent”, borrowed from party politics, whereby diverse viewpoints, backgrounds and interests (the “voices in the room”) are brought together to engage and dialogue. How to generate inspiration for a grassroots upsurge to reclaim our future. AWAKE: Facing the truths of climate change. CELEBRATE: Using the arts to express our love for the Earth and all life. ACT: Developing our response, locally and globally. The Findhorn Foundation was officially established as a charity in 1972 but this was ten years after Eileen and Peter Caddy and their three small sons found themselves at a turnout near the Moray Firth on the northeast coast of Scotland, between the towns of Inverness and Aberdeen. Dorothy MacLean then joined them, and together they created a productive farm where everyone said nothing could grow. The Findhorn Foundation is now an iconic eco-community with two campuses and over 500 members. It is associated with the UN Department of Public Information and is the holder of the UN Habitat Best Practice designation. It is the co-founder of the Global Ecovillage Network (GEN) and home to large and productive, flourishing gardens. It is a community of visionary collaborators and a place where cutting edge workshops, conferences, TED Talks and similar events take place. Peter and Eileen Caddy have passed on, but Dorothy MacLean, now in her 90’s, still lives there and is tenderly attended by a devoted team of caregivers.